Recently, a small but growing number of documentaries have sought to explore the relationships between different religions and their followers. US TV channel CBS has aired a series of “interfaith specials” this year and there are number of exciting small-budget documentaries currently in the making. But if you really want to understand interfaith relations, there is one must-see movie: Disney’s Shrek. At least, that is according to Fuad Nahdi, founder of Q-News, a Muslim current affairs magazine, and executive director of the Radical Middle Way, an organisation set up in the wake of the 7/7 bombings to promote a moderate understanding of Islam and provide an open environment for young Muslims to explore their faith. Based in the UK, Nahdi and his charity are now at work everywhere from Indonesia to Pakistan to the Sudan. On Wednesday evening, Nahdi was awarded an Interfaith Gold Medallion for his work towards integrating those of different faiths. 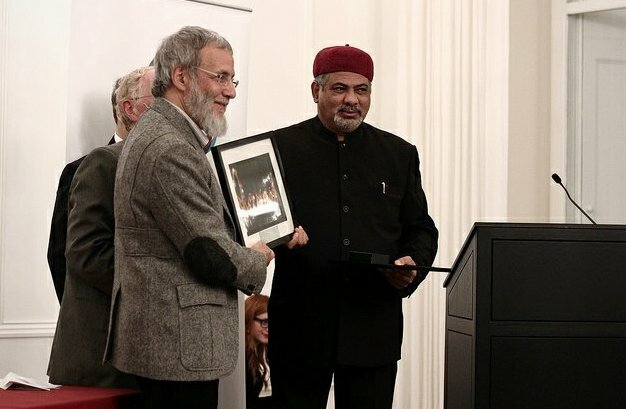 Presented by Yusuf Islam – aka the musician Cat Stevens, who converted to Islam in the 1970s – and organised by interfaith charity 3FF (the Three Faiths Forum), Nahdi joins an illustrious list of previous recipients, including Pope John Paul II, King Hassan II of Morocco and Cardinal Basil Hume. In his acceptance speech at Canada House, Nahdi emphasized the shared roots of Judaism, Christianity and Islam and in particular the important role Moses and Abraham both play in Islamic belief. “For someone from the Muslim tradition like myself, interfaith is not an option; it is an intrinsic part of my faith,” he said. “If I don’t believe in Moses, Abraham or Jesus then I cannot be a Muslim. “When I look at the three Abrahamic faiths, it is so clear that they all play a part in each others’ stories – it reminds me of the film Shrek,” he joked, “where the greats of the ancient stories – Snow White, Pinocchio and Hansel and Gretel – all find themselves part of the same movie. The prize formed part of 3FF’s “education awards”, aimed at celebrating the best efforts to foster mutual understanding and respect across religious boundaries. Much of the work the charity undertakes is in schools, helping to ensure that tensions between faith communities are avoided in future generations. Although Britain is often mentioned for its multiculturalism – a point we should be proud of – children from those different communities sometimes do not have the opportunity to get to know each other in any significant way. With various messages about other cultures coming from the media, their parents and those around them – and bereft of any way of learning otherwise – tensions inevitably arise, and at a young age. One session 3FF arranges in schools is “The Art of Asking”, where children are encouraged to ask anything they want about other faiths. “Why do Christians think they’re superior to everyone else?”, “Why do Muslims fast before they bomb people?” and “Why are Jews always trying to conquer Muslims?” have all come up. If these are questions the children are thinking, it’s important they are encouraged to voice them in an open environment where they can be shown why the assumptions behind their questions are wrong. Since Nahdi came to the UK from Kenya 27 years ago, he says he has seen interfaith relations gradually become more of a priority. 3FF was founded in 1997, 12 years after his arrival, by a Muslim sheikh, a Christian priest and a Jewish philanthropist. “At first, much effort had to be put into persuading people of the importance of Islam” and integrating believers of different faiths, says Revd Dr Marcus Braybrooke, one of the co-founders. When I visited one of the charity’s “linking” projects between the Muslim Islamia school and the Catholic La Sainte Union in June, children there said they keep in touch with each other outside of the compulsory sessions. They live so close to each other and cross paths every day, but would never have met had it not been for the charity, they said. “Every school should do this,” one told me. In the end, as Revd Braybrooke concludes, “one gets rid of religious hatred not by legislation but by the educational work of interfaith organisations.” That is how friendships are formed, understanding is built and barriers are broken down. 3FF, currently celebrating its 15th birthday, now works with more than 150 schools and 10,000 young people of all religious beliefs, from Buddhists to Sikhs to Humanists. To find out more visit www.3ff.org.uk. For more information on Fuad Nahdi and the Radical Middle Way, visit http://www.radicalmiddleway.co.uk. By Jessica Abrahams. Originally published by The Times’ Articles of Faith blog, 23rd October 2012. View here.